Let’s just be honest here, people. Most of you will be picking up Final Fantasy Type-0 HD not for the game itself, but for the Final Fantasy XV demo that is included with day one copies. While the demo is all kinds of neat, don’t sleep on that little Final Fantasy game packaged in with the demo. This almost five-year old PlayStation Portable title brings a lot of good things to the table — even if it does show its age. With Type-0 HD, players are dragged into a world war that is raging in the world of Orience. Here, there are four nations referred to as “Crystal States,” who are fighting each other for control and power of the realm. Players are in control of a special group of cadets called “Class Zero,” as you try and save your Vermillion Peristylium region and stop global war. The story takes a bit of time to get started but once it does, you are provided a nice story of war. For me, this was my favorite Final Fantasy story since X. Sure, it doesn’t have the overall depth of others before it, especially when it comes to the characters, but it’s not shallow either. There are a lot of chances to open up more about each character through optional dialogue and the mature and bloody story really stuck with me. Also, if that opening scene doesn’t drag you in and have you excited about its story, then I don’t know what to tell you. Most of your time with Type-0 will involve combat or free time between story missions. After you complete a story mission, you will be given a time limit before the next mission day, usually in the range of six hours to three days. During this time, you may freely roam around your Academy, talking to people, performing quests, buying armor, and going through side missions. During this time is when you will be privy to a lot of your character’s depth, as you can partake in optional dialogue to learn more about the characters and the world. You will want to be careful though, as each character you approach with a “!” over their head will drain you of two hours time. However, each of these situations will grant you a reward afterwards, and sometimes an ally in battle, so it is beneficial to search them out. In this free time, you also have access to the Arena. Here you will have the ability to take one cadet into battle to earn small amounts of EXP and Phantoma (which I will touch on a bit later). This place is an essential stopping point, as you HAVE to grind out some levels here to stay competitive on the story missions. It’s even more needed when you consider that during mission combat, only your three selected cadets gain experience. Free time is over now, it’s on to the story mission at hand, and more specifically, the combat. 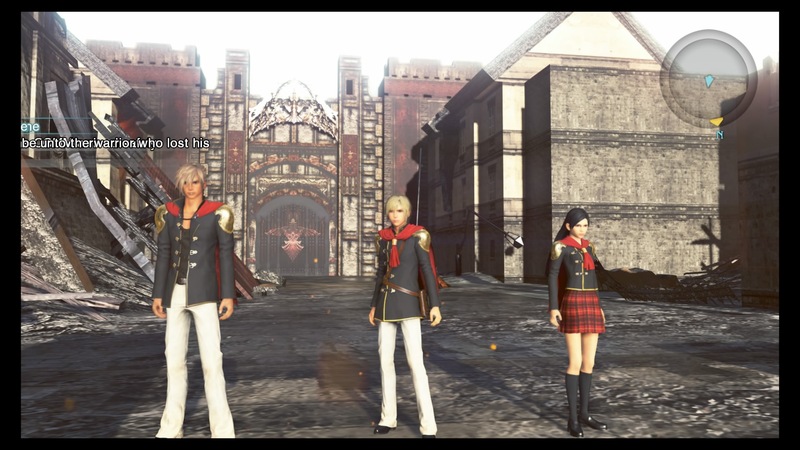 Final Fantasy Type-0 HD places you on a battlefield similar to Kingdom Hearts, where you will control three cadets in an action packed, free moving battle system. I truly cannot get enough of this battle system, which is easy to learn but hard to master. You will need to master locking on to one enemy, while dodging another, and prepping the perfect skill to use. What makes it even better is that you have access to 14 cadets, each with their own style of combat and abilities. Square Enix does a great job of making sure that you will need to level up each cadet, as they all do better in certain situations and finding the right combination of three for each level is a lot of fun. For example, one stage might call for a ranged character, while another stage will have you needing someone to really bring down the hammer on some mech enemies. It isn’t a simple button masher, as you can hold down some attacks to power them up, or perform an ability to throw out a healing circle mid battle. Using the d-pad to switch between your three cadets at will adds a nice touch to battle. Going on the assault with Eight and his fists, then switching to King and dropping back to rain bullets on your enemies with twin shooters is just flat out fun. Players will also need to absorb Phantoma from downed enemies, which in turn replenishes MP, damages nearby enemies, and will allow you to trade in gathered Phantoma towards improving your magic spells. Oh, and if that’s not enough, you also have the ability to sacrifice your leader in battle to summon an Eidolon like Infrit or Shiva to turn the tide in battle for a set amount of time. If you don’t like taking on the game alone, you will have the option to receive support during each mission. By selecting yes, you will randomly have NPCs jumping into battle in place of one of your cadets and helping you take out enemies. By selecting to accept this option, you will gain SPP points, which can be traded in for exclusive spells and equipment. So if you are having trouble with a mission or just don’t like switching between cadets so much, this is a nice perk. As you level up, you will earn AP points, which can then be used to purchase abilities. Each character can have two attack/buff oriented abilities equipped, along with one defensive ability such as cure or block. Picking the best abilities for each character, and specifically your three person group, can be essential to winning in battle. Square Enix has given us a game that is at times, brutally unforgiving in it’s combat. You will have plenty of battles where you get all the way through only to get slaughtered at the end by a boss. Thankfully though, any experience gained during your level will stick with you even if you fail. This is a huge perk that takes a bit of the sting out of what is a fairly difficult game at times. Besides combat with your three-man unit, you will also be able to perform some battles across the world map, similar to an RTS game. Here you will have a single cadet taking out waves of enemies on the map while directing your allies to attack specific bases. I didn’t find myself overly impressed during this mode, though mostly because it took me away from the core combat. While I have told you about all the good things concerning combat, let’s also touch on the bad. The camera, if you so choose to not lock on, is downright atrocious. I mean, there is no option to even decrease its sensitivity. Often times you will have your camera zipping from right to left like The Flash, leaving your head spinning each time you tap the right analog stick. It doesn’t help that a lot of the dungeons feature tight spaces, making it even worse. However, just holding the R1 button to lock on quickly fixes a lot of the issues and is a must during hectic combat. With every HD remaster that is released, people will want to know how the game looks and sounds in HD quality. This is where things really begin to unravel with Type-0. There is just no masking the fact that this is a PSP game that got remastered and thrown onto consoles. While there are some areas, namely the Academy, that look halfway decent, the rest of the game is a muddled mess. Environments are just ugly and characters faces are blurred. To really hurt people’s feelings, the game actually seems to look a bit better when played through remote play on your Vita. Audio wise, things takes a much better turn. The score here is just enchanting, bringing a nice sound to your ears every time you play. Things are a bit more mixed when talking about the voices however. The dub work done for the male cadets leaves a lot to be desired, specifically looking at you Nine. The female side is a lot better and has some real standouts. Of course, you can also go the smart route and just use the Japanese audio, which is very well done. It’s hard to recommend Final Fantasy Type-0 HD at full price because it feels like a $60 PS Vita title. The game really shouldn’t have released on a home console, as it makes a clunky transition from the PSP to next-gen and lacks the polish you would expect from a console release. That said, this is still a really good Vita game (Haha! BURN!!) that features a well designed and addictive combat system, with a story and characters that will keep you engaged. Seriously, this is one of the better combat systems in a JRPG that I have played. If you can get over the price tag and its obvious console shortcomings, you will find a game that is well worth the experience, XV demo or not. Review copy provided by publisher. For more information on scoring, you can read our Review Policy here.